Preheat oven to 350°F.In a large bowl, whisk together Betty Crocker brownie mix, included Hershey's packet, egg, butter, and the amount of water requested on the back of the box. Spray an 8x8 brownie pan with nonstick baking spray. Spread brownie batter into pan. Press mini candy bars into brownie batter, until about halfway impressed into batter. Bake brownies for 18-23 minutes, or until they bounce back when touched lightly with finger. Remove and cool completely. Frost brownies with Betty Crocker™ frosting. Drizzle caramel on top of frosting and swirl it into the frosting with a spoon or knife. Allow frosting to firm up slightly before covering or slicing into squares. Kick it old school in your kitchen with this classic recipe for Hershey's Chocolate Brownies. Made even better -- and quicker -- than Grammy's! Remember coming home from school to a fresh pan of Grandma's brownies? Almost every grandma's recipe box includes a recipe card for delicious homemade Hershey's brownies made from scratch. Go ahead -- check and see! Mmm. 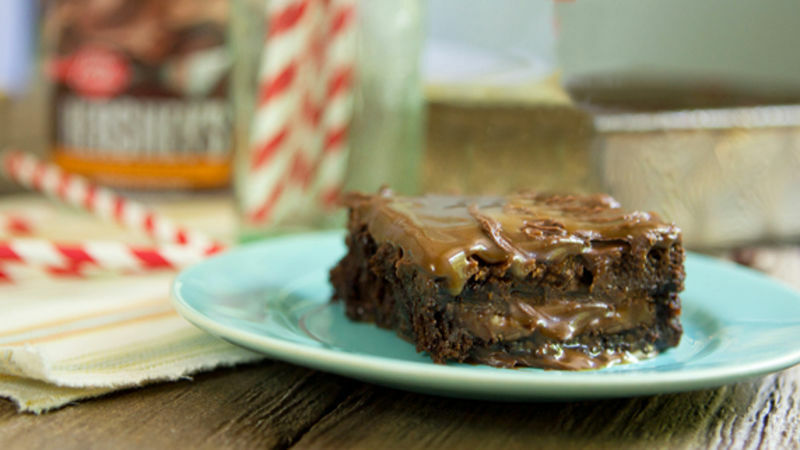 There's nothing so delicious as decadent chocolate and caramel brownies. And the good news is you can still make 'em -- but easier than ever! Start with a box of Betty Crocker Ultimate Fudge Premium Brownie Mix with Hershey's. How happy are we? There's an entire pouch of chocolate fudge sauce right in the box! Combine the brownie mix together with the egg, butter, and a whole lotta Hershey's sauce. A bit of water, too, as per instructions on the back of the box. Mix it up, set it next to your farmhouse window. Take in the view. Now spread that batter into an 8x8 pan. Gently press 8 mini caramel-chocolate bars into the batter. And bake that baby up. Prep thy knives with a wee taste-testing of chocolate frosting and thick, gooey caramel sauce. A little licking is perfectly acceptable. Once your brownies are cooked and cooled, frost them with chocolate frosting. Swirl, swirl, happy swirl in a bit of caramel sauce, then allow to set slightly before cutting or covering. Slice into squares, grab a pretty fork, and enjoyyyyy. Just as good as grandma's brownies…no one will ever know you made them from a box! Slice, and enjoy the caramelly homemade goodness!